When looking at the high-performance homes being built in Briar Chapel, you will often hear us refer to a home’s “HERS” rating. Let’s take a minute to explain what this is and how it helps predict energy consumption. 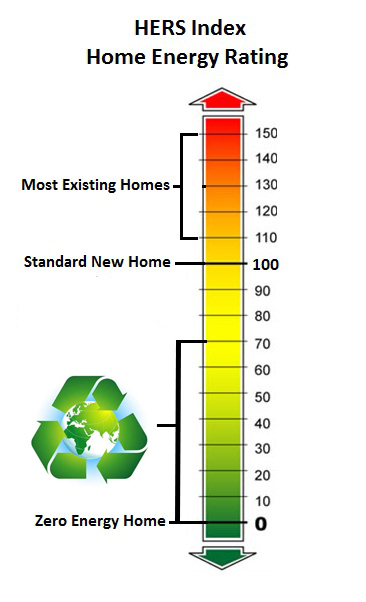 The HERS (Home Energy Rating System) Index is a scoring system which was developed to provide a standard measurement of a home’s energy efficiency and expected energy costs. HERS is the housing equivalent of MPG (miles per gallon) with cars & trucks. It is based on a standard new home built to code, which is given a score of 100 on the HERS Index. The lower a home’s score, the more energy efficient it is in comparison to the same home built to code. More specifically, each 1-point decrease in the HERS Index corresponds to a 1% reduction in energy consumption. This translates directly into savings on utility costs for the new homeowner. For example, one particular 2004 sqft home in Briar Chapel with a HERS score of 56 is estimated to cost only $1342 to operate per year! That includes electricity, natural gas, water heating, heating/cooling, and service charges. The high-performance homes in Briar Chapel typically score between 49-72 on the HERS Index, which means they are 28-51% more efficient than similar homes built to code. More impressive is the fact that these high-performance homes can be over 58-81% more efficient than homes which are ten years old! All builders in Briar Chapel are required to use independent energy auditors to determine the HERS scores of each home they build, so they can provide this information to new homeowners and earn the ENERGY STAR and NAHB Green Certified ratings (among others) as well. To learn more about the HERS Index, including how it is calculated by a home energy rater, we encourage you to watch the following video or visit http://www.resnet.us.home-energy-ratings.